Before I quit my job (I’m not quite ready to say retired) I thought that having much more time on my hands meant that I would be able to do more. Get fitter, ride more, hike more. But it hasn’t worked out that way. Instead I’ve had to gradually adjust to the fact that my body is more fragile than I would like. After a hard ride or a long hike my knees hurt. I need a day, and sometimes two days, to recover. During that time I ice my knees between one and several times a day (bags of frozen sweet corn kernels work well). I’ve tried DMSO. Nothing fixes my knees for good, but they are well enough after a day or two to go out again. This means it’s easier to ride by myself than to go with others and have to ride harder than my knees want. And if I’m going to ride by myself, I’d rather do long rides that are meaningful and memorable. I’m also finding that I’m not as strong or fast on the hills as I once was. I’ve noticed the decline over the last few months, and really noticed it this weekend when I was unable to keep up with my daughter on a steep hike. Many years ago I decided to do the things I want to do while I’m still physically capable. So for years I’ve been doing the big hikes and rides and climbs that excite me: hiking the Colorado 14’ers, climbing via ferratas in the Dolomites, cycling Mexico’s Copper Canyon, France’s Alpe d’Huez and Col du Tourmalet, California’s Death Ride and Everest Challenge, Colorado’s Death Ride and Grand Loop, Utah’s Kokopelli and White Rim Trails. When I die I want no regrets; I want to be happy with the life I’ve had. If there’s any moral to this post, it’s to get out and do the things you want to do now, while you can, not waiting for retirement, not waiting for some future when you’ll have more time. To slightly paraphrase Woody Allen, if you want to make God laugh, tell him about your future plans. 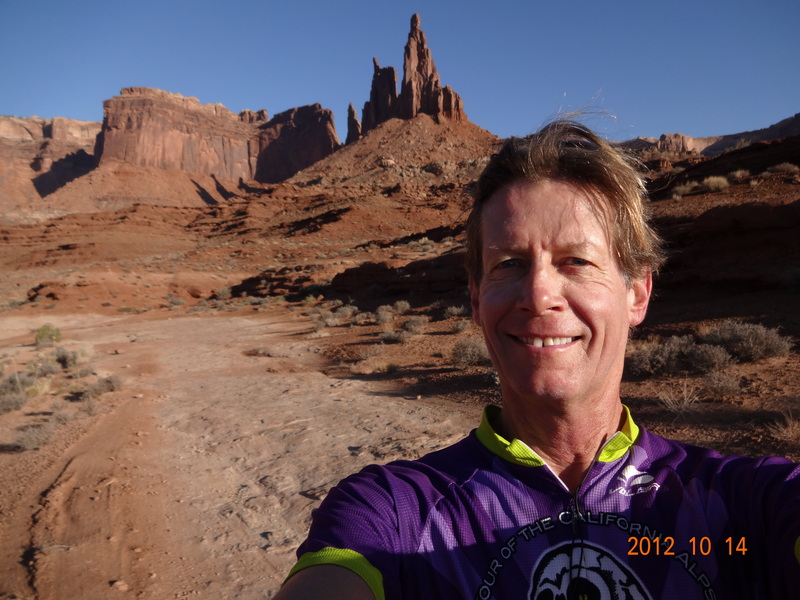 This entry was posted in Retirement and tagged Cycling, Hiking, retirement, sore knees. Bookmark the permalink. This was very timely for me. The notification about this post came in almost simultaneously to me receiving a note from a dear college/cycling friend who is dying of cancer. I rode with him a couple of months ago and it seemed like he was going to beat the cancer – and he did – but another type came back and is now essentially untreatable. This makes me question equally all of the traits that we attribute to god be it laughing, being vengeful, or kind and loving. I had a session with Dr. Bill Sands, former head of biomechanics and engineering for the USOC, to analyze my running and prescribe solutions for my various aches and pains. At one point I asked him what to do about some ankle pain I routinely had. “Ice it every day,” he said. “How old are you again,” he replied. I love it – and totally identify! Thanks Steven.